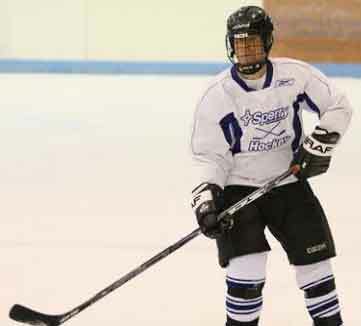 Joe Nasevich started the Sperry Marine Hockey Club in the fall of 2003. The idea was to run a weekly adult pickup game every week. It was supposed to run from October to May, but Ed Goodrow and his wife Cathy Goodrow liked it so much that they agreed to run it in the summer as well. So now we play year-round, with the occasional break for holidays. By 2006 the list of alternates had grown so long that people were only able to play every other week. 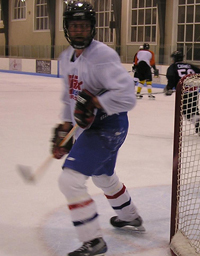 So in the spring of 2007 we expanded to two games per week – Tuesdays and Thursdays. Ed Goodrow took over full-time administration of the Tuesday night game and Joe Nasevich ran the Thursday night game. Unfortunately, the Thursday games ended in the fall when college and youth hockey snapped up all the good ice times. Don’t worry though, like a crocus blooming in the snow, Thursday night hockey will return! In 2007 Brad Sayler took over list administration duties for the Tuesday night games and David Delamere took over Thursday nights. Commissioner David is also keeping busy organizing the odd weekend game whenever the Main Street Arena has an open slot. As of June 2014, we have 309 people on our mailing list, approximately 125 of whom are “active” players who have played in one or more Sperry hockey games in the last three months. The Sperry Marine Hockey Club exists just so we can play hockey every week. We provide an opportunity for new and experienced players to play in a friendly, noncompetitive game on a weekly basis. 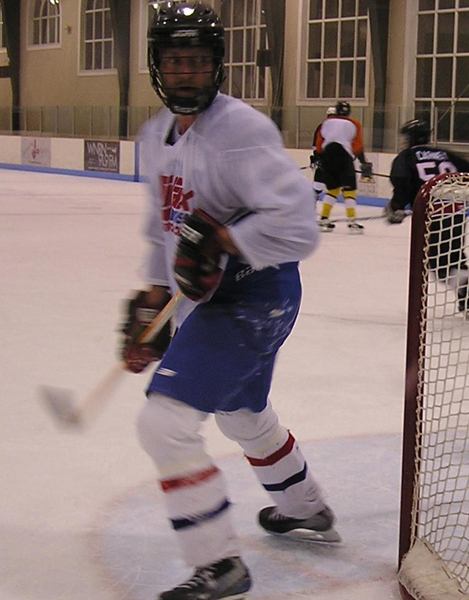 We also play in the occasional hockey tournament, and we sometimes challenge other groups to a game. We also help promote the game of hockey in Charlottesville. Since the club’s inception, the Main Street Arena’s hockey league has grown enough to support separate A, B and C leagues. We like to think that we had something to do with that. Lastly, we provide an opportunity to socialize both after the game and away from the rink. Occasionally we’ll organize a trip to see a professional hockey game in Richmond or Washington, DC.